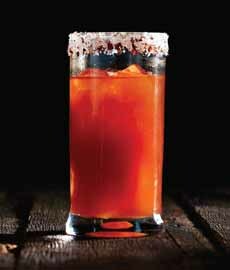 The Bloody Beertail: Substitute beer for the vodka in a Bloody Mary (photo courtesy Pampered Chef). January 1st is National Bloody Mary Day. But if you prefer beer to vodka, have a Bloody Beertail instead. It’s a sister beverage to Mexico’s michelada. The cocktail is 1-3/4 cups, plus ice. We adapted the recipe from Pampered Chef. 1. MIX the rim ingredients—red pepper flakes and salt—on a small plate. Rub the outer rim of a tall glass with the lime wedge; dip in the rim mixture and twist to coat. 2. FILL the glass with ice. 3. ADD the drink ingredients to the glass; stir and serve. *You can have fun with the ice cubes. Whether using plain ice cubes or tom ato juice cubes, you can fill the tray compartments with fresh dill or a stuffed olive.